Successfully Added Vape Kit Kamry K1000 Epipe E-Cigarette Vape Mod - 510 Thread, 900mAh 18350 Battery, 3.5ml Tank to your Shopping Cart. The Kamry K1000 is an e cig vaporizer in the shape of a pipe and has a classical wooden look but is made from metal. This vape can be used with all kinds of tanks for whatever hit you want and will certainly get people's attention with its authentic pipe styling's. The Kamry K1000 mechanical mod e-pipe has a standard 510 threaded fitting so you can swap out the tank for any regular 510 threaded vaporizer tank. The included tank is a single coil but makes a good seal, so there is no leaking whatsoever, which as it lays down a fair amount when not is use is a real winner. This is an e-pipe vaporizer runs on an 18350 battery (included) and has a nice comfortable feel to it. 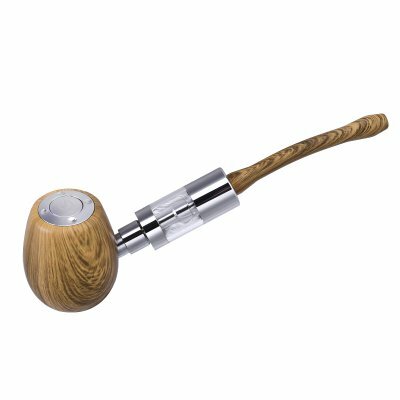 Sitting nicely in the hand it can easily be fired using the thumb or index finger and feels like a real pipe. The top filling tank holds a modest 3.5 ml of ejuice and a fully charged 18530 battery will bring around 800 puffs of use. This e-pipe mechanical mod kit comes with everything you need to get started including battery and charger so all you need is your favorite eliquid. This mod kit is presented in a zippable soft case for easy storage and transportation. The Kamry K1000 epipe vaporizer kit come with 12 months warranty, brought to you by the leader in electronic devices as well as wholesale mods and vape kits..